Shiny Mega Diancie in game: 16 Who? Important notice! 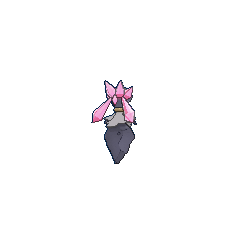 Pokemon Shiny Mega Diancie is a fictional character of humans. Diancie (Japanese: ???? ?— Diancie) is a dual-type Rock/Fairy Mythical Pokémon introduced in Generation VI. While it is not known to evolve into or from any other Pokémon, it can Mega Evolve into Mega Diancie using the Diancite. Diancie was officially revealed in the March 2014 issue of CoroCoro magazine. Diancie is a gray, sylph-like Pokémon with a white chest and arms that resembles a dress. It has a headdress which consists of pink crystals, four short ones cresting along top pointing upward and two long ones on either side of its head pointing downward, with a diamond-cut centerpiece framed by its slim gray ears. A smaller pink crystal is also embedded in the back of its head, and a gold nugget is embedded in its forehead. Its eyes are red with pink irises. A gold crescent circles its neck, with the ends joined by a rhomboid gem. Its lower body resembles a large oblong chunk of stone, with a large pink crystal protruding from it. 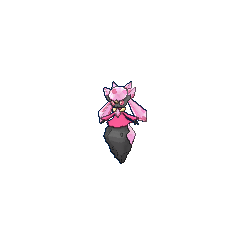 Mega Diancie retains Diancie's color scheme but instead possesses a dress-like structure made of pink gems and a larger chunk of gem replacing the large chunk of rock. The rhomboid gem on the back of its head becomes rounded and two smaller gems grow from it at the bottom. More gold pieces support the large diamond at the lower body. Its centerpiece becomes heart-cut instead of diamond-cut. It also gains two ribbon-like structures growing from the two small gems on the back of its head and are tipped by two small floating rhomboid gems on each ribbon. The two long pink crystals behind its head shrink into one and two more of these hang from the centerpiece and are also tipped by a small floating rhomboid gem each. A larger gold crescent also circles its torso. Because of its noble beauty, Mega Diancie is commonly referred to as "the Royal Pink Princess". Diancie is born from a Carbink that undergoes a mutation. It can instantly compose diamonds by compressing the carbon in the air; these diamonds can then be used to defend itself. It can absorb light with a perfect balance and emits a radiance that looks like nothing in the world. According to legends, it can protect its travel partners from accidents and illnesses. Diancie is the only known Pokémon that can learn Diamond Storm. 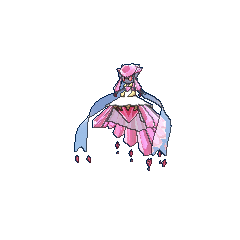 Diancie first appeared in Diancie — Princess of the Diamond Domain, which is set before Diancie and the Cocoon of Destruction. 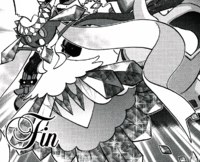 Diancie appeared in the manga adaptation of the seventeenth movie. Diancie debuts in the X & Y chapter, where it was mentioned by Gurkinn as he was escaping the destruction of the Tower of Mastery. It was sought after by the owner of the Shabboneau Castle, who sent his butlers out to obtain Diancie. One of the butlers, actually a thief, found Diancie and attempted to steal it. With the help of Gurkinn, Diantha, and Korrina, the thief was defeated and sent running away. Afterward, Diancie leaves with its Carbink companions to find a new home. 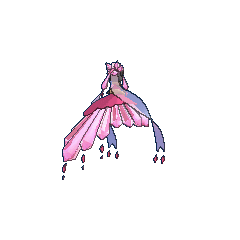 The same Diancie also appeared in the Omega Ruby & Alpha Sapphire chapter, having helped Ruby and Latios from drowning after they were knocked into the sea. After the crisis is over, Diancie enters a Pokémon Contest Spectacular with Ruby, using its Diancite, it Mega Evolved into a Mega Diancie. After the events of the thirteenth chapter, Diancie left with Steven to the Kalos region. It can instantly compose many diamonds by compressing the carbon in the air between its hands. Erases disruptions or Pokémon covered by a barrier (max 10). For other sprites and images, please see Diancie images on the Bulbagarden Archives. 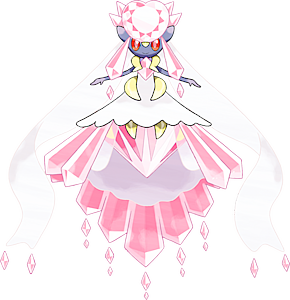 Diancie is the only Pokémon introduced in Generation VI that is capable of Mega Evolution. Diancie is also the only Mythical Pokémon that is capable of Mega Evolution. Diancie is tied with Carbink for the highest base Defense stat of all Fairy-type Pokémon. Mega Diancie has the highest base stat total of all Fairy-type Pokémon and is tied with Mega Tyranitar for the highest base stat total of all Rock-type Pokémon. Mega Diancie also has the highest base Attack stat of all Fairy-type Pokémon, and the highest base Special Attack stat of all Rock-type Pokémon. Mega Diancie's Defense and Special Defense decrease is the largest single stat decrease of all Mega Evolutions, at 40 points. Tied with Deoxys, Diancie has the lowest base HP of all Mythical and Legendary Pokémon. 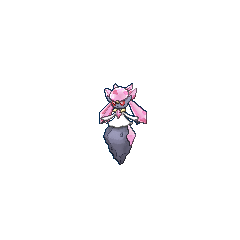 Diancie's origins as a mutated Carbink is reflected in its near-identical moveset and learn rate, though it learns Trick Room in place of Power Gem in Generation VI. Diancie's Pokédex on Pokémon.com erroneously states that its gender would be either male or female, despite being a genderless Pokémon. 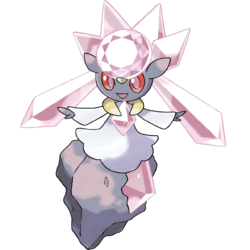 Diancie is the only Rock-type Mythical Pokémon. Diancie could be based on the carbuncle, a mythical fairy-like creature that was rumored to have a jewel embedded on its forehead. Diancie could also be loosely based on a "princess-cut" diamond, referring to its princess-like appearance. Diancie may be a combination of diamond, fancy, and ? ishi (stone). It may also include pixie.